After the antics surrounding the Mysterious Aluminatti Society, the Principal of Reon Elementary School has had enough! With the big PTA Meeting on the horizon and his school's reputation on the line, he does what any other reasonable Principal would do: Orders Draco and his "merry band of idiots" to be thrown into the newly built juvenile detention center, Bully Island, until they're old enough for college. After this fiendish decree, our heroes are blindsided by an army of Hall Monitors and are swiftly thrown behind bars. But Slugamor, being the slippery slug that he is quickly manages to escape the prison. The others, however, are not so fortunate. Now it's up to Slugamor and Draco to work together to free their friends and Escape From Bully Island! 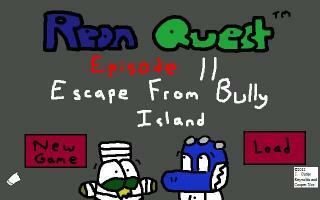 Reon quest 2 continues where episode 1 left off. and has all of the fun and enjoyment that one received from the original plus more. Through great music, puzzles, and humor, I found myself constantly smiling while playing this game. An overall great experience that I would highly recommend tryng out. Reon Quest Episode 2 is very amusing, the hand-drawn graphics are superb, and it now has a save/load feature (!). 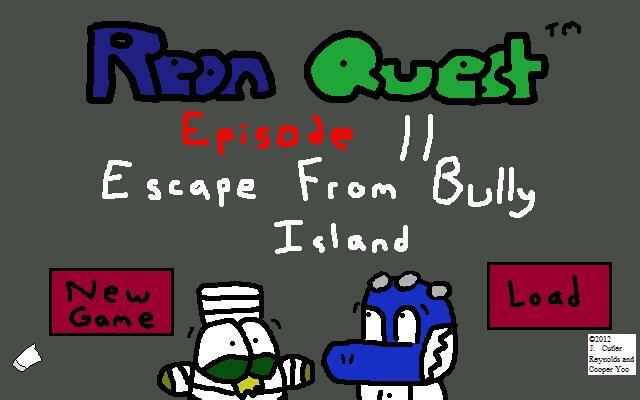 The saga continues with Draco and Slugamor's quest to free fellow classmates from Bully Island, a makeshift "jail" that includes characters from the last game, a really large vat of chili, and an evasive pair of bandits. Meanwhile you might take a trip to the Burp-o-mart, which features a real live burping aligator. Overall, really entertaining and fun to play!